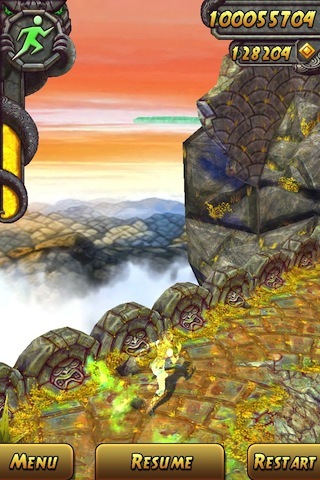 I’ve been playing Temple Run 2 since day 1 and it was amazing. The amount of detail you find in throughout the game and its game play experiance just beats Temple Run, Temple Run : Brave and not to forget the dozens of clones you find out there. Now lets get to the tips that you can use, in order to score BIG! This is very important because unlike in Temple Run and Temple Run : Brave you cannot unlock achivements until it prompts you to go for it. Its all about the objectives. The more objectives you complete, more mulitpliers you get. More multipliers you get more you can score within a small time frame. Therefore always keep an eye on what objectives you have to complete and focus on them atleast until you get to 50x multiplier. Collect them as much as possible and SAVE them for later. Use them only to upgrade your Powerups and Ablities, Like the multipliers the Abilities and powerups will help you score BIG within a small time frame. Watch your feet, because there can be times where you will die in the game trying to reach for one. The truth is we all have our own game style, depending on that you need to pick your powerups. I use “Boost” and I use it because it helps me get through obstacles fast, besides its like autopilot all you have to do is just keep an eye on it until it ends. I save it as much as possible to use on rough places, the places where you have to jump precicely, as an example when you have 2 spike rollers, or streams flowing next to each other. Also you can activate Boost and pause the game, if you need to relax a bit. I do this because sometimes you will experince a slight lag when you resume the game from pause state and you can fall off a cliff. The video below is one of the runs I managed to capture with the AirPlay feature on iOS. There is a slight lag in the gameplay because it was streaming to my laptop. Enjoy the Run. You might pick a couple of tricks watching my game play. Hope you managed to grab some idea on how to effectively use “BOOST” and get through some rough edges. After achiveing almost all the objectives and playing 37million I was so bored. So I thought of using a coin hack to get some Gems and then make it to the world ranks. True I had loads of gems to “save me” but I had to run all the way till I make it to 100 Million. 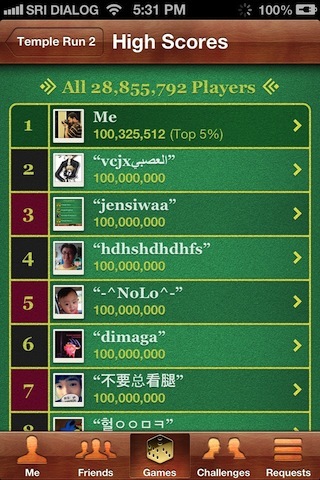 If you have a closer look at the Game Center world ranks you would notice that the highest score is 100,000,000 and that is because the game quits once you reach 100Mn. But I managed to go beyond with a little trick towards the end. 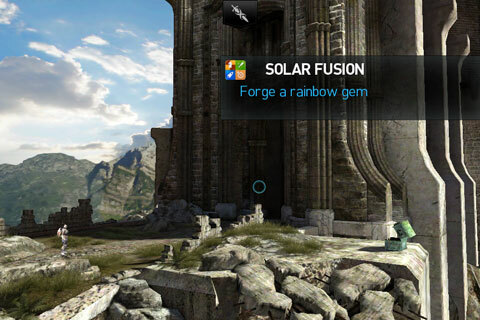 Please let me know if you need assistance in adding the game file to your device. Also make sure to backup your original game play file, so that you can always return to that whenever you want.